I think the biggest question that I hear from people is about the difference between witchcraft and Wiccan spells. So here I will try to explain what "witchcraft" and "Wicca" mean, and why you don't really need to worry about them when you are getting new spells. Though the terms may not make a different in your spell search, that does not mean they are the same thing. They most certainly are not, as I am about to explain. The reason it doesn't matter, is that spells are the same regardless of who is casting them. We're start with Wicca. It's a religion, and though based on many ancient concepts, it's a fairly new religion. Those who follow this religion do practice witchcraft (see below) but that is not what defines a Wiccan. I have a full article on the Wiccan religion that you can reference, but here is a quick run-down of what it means. 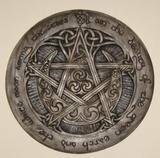 Wiccans worship both a God and a Goddess, the celebrate the 8 sacred Sabbats of the year, they cast circles when performing spells and they may or may not be part of a coven. Being a Wiccan is more about what you believe than what you do. Witchcraft is an ancient art of practicing magick, and it is not a religion or a belief system. Wiccans do perform witchcraft, but you do not need to be Wiccan to do so. The concept of witchcraft is that you can use the natural energy within yourself to make change in the world around you. You can boost that energy by adding natural items like herbs, stones and other elemental objects to your spell. While Wicca is a religion, witchcraft is just a practice. Something that you do. Hopefully that has cleared up some of the misunderstandings between these two words. So once you understand what these words mean, you should see that spells for witchcraft and Wiccan spells are the same thing. Any witchcraft spells becomes a Wiccan spell if it's a Wiccan who is casting it. The spell itself is the same. So go ahead and look for more free online spells through the rest of the site. They are organized kind of loosely by the categories at the left, including pages for Wiccan spells.